The sky that day was a photographer’s dream, nice variety of clouds, a slowly setting sun, as Nikhil mentioned once “even a monkey could have gotten good photos that day”. I’m not entirely sure about the monkey, but I know we came away with some good ones. For me, I liked this one because of the clouds, and then there’s the lone man walking along the wall, and the lone bird soaring in the sky. I love the dramatic sky, such interesting movement. It could be a backdrop to a fiction novel. I could write a story using this image. Awesome perspective with the person and the bird of flight. Michael, I just finished a short story about a boy protagonist and plan to expand it into a longer fantasy novel for kids. I’m waiting for my instructor’s feedback. In any case, when I saw this photo, I thought wow, this looks like it could fit into the fantasy forest story of the boy’s dream where he is walking into the night along the river. I could add a few trees for the story’s forest. It’s the sky that struck me. These stories are for a class, but my goal is to publish the finished story. It may take me a couple months, but I can send it to you for your feedback. Gorgeous b&w. I may have gotten one 5-star image, but you seem to have gotten a large number of 4-star ones. A very good shot. I like the dramatic sky. And, Michael, don’t sell yourself short. I think that some of your shots can compare with Nikhil’s. Thanks Bob, just being self-deprecating as usual. Nikhil and I are actually referring to a superb shot he got that day, and it took me four months or more to get up the nerve to process any of the images from that day 🙂 Thank you for your kind words and encouragement, they mean a lot! One word. BEAUTIFUL! Thought something was wrong with the shot as I scrolled down, then realise it was a bird. Hi Mike, that is a really nice pic. This really is wonderful, Michael. I am happy to see it a little larger on your website. I love the wall of rain on the right, just hitting the water, and the wonderful texture of the foreground. The lone walker and bird are the icing on the cake. Thanks Cindy! that wall of rain came out better than I thought, I also had the same wall of rain in an HDR from this spot as well. This is a really great moody atmospheric shot. Incredible sky- and is that a downpour off to the right hand side? Thanks JP, yes it is. The sky looks amazing yet, scary in an odd rain’ish sort of way! Love all the lines in the lower portion of the image, really lead my eyes through the photo. Lovely shot Michael. Wide angle combined with infinite DOF makes this a great landscape shot. Bird on the flight along with the lone man add a nice visual element to a great shot. Thanks Sasi, it really did come together nicely! When I went for it I had only noticed the man walking, not the bird, so I was happy to catch that! 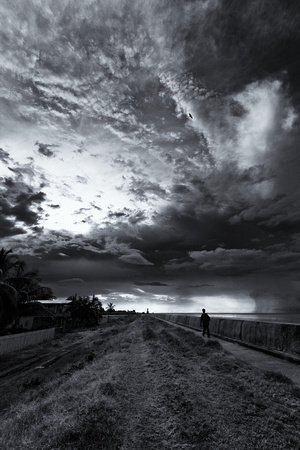 great composition – moody and dramatic.